Undas or All Saints’ Day is being celebrated by Filipinos to honor their departed loved ones by offering them prayers, and visiting their final resting place. To ensure motorists’ safe travels going to memorial parks or to their hometowns, Petron Corporation will be activating its Lakbay Alalay starting October 31. Petron Corporation will offer various road assistance to motorists who will stop at stations on major highways, such as the BLOWBAG Safety Check, free parking, and traffic assistance to ensure a safe, and hassle-free trip. The staff will also hold a road safety demonstration wherein they will emphasize the importance of using seatbelts, and the dangers of drunk driving by letting the motorists try the seatbelt simulator and fatal vision goggles. The Lakbay Alalay tents will not only provide free safety checks, they also offer free 15-minute massage to relax every motorists muscles from the long drive. Petron’s food and lifestyle partners have product sampling and fun activities. To complete the total customer service, clean and accessible rest rooms will also be provided. Meanwhile, on November 1, from 7:00 AM to 4:00 PM, Petron will put up Lakbay Alalay tents at F. Ignacio Station on Dr. A. Santos Ave., Sucat, Parañaque, to provide assistance to those visiting major memorial parks in the area. To make things sweeter for motorists during this week’s holidays, Petron added the Lamborghini Aventador to the Petron Toy Car Collection. Whether customers are heading out of town or staying in their respective cities, they can head to Petron stations nationwide to get their hands on the new addition, as the promotion will be available from October 18 to November 4 at participating stations nationwide. Unveiled at the 2017 Geneva Motor Show, the Aventador S boasts of a 6.5L V12 engine that produces 720 hp and 509 lb-ft of torque. It is equipped with four-wheel steering, carbon ceramic brakes, and a dynamic suspension with four modes — sport, street, track and individual. The Petron Lamborghini Aventador S Toy Car Collection is scaled at 1:32 and is about 6-inches long. It is available in four colors — gold, blue, orange and black. 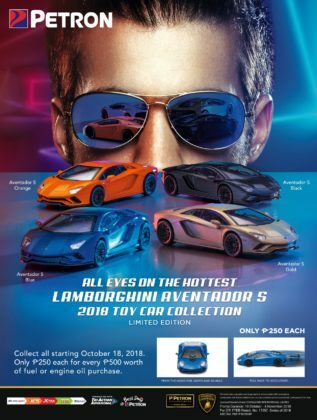 Every single or accumulated purchase worth Php 500 of fuel (Blaze 100, XCS, Xtra Advance, Turbo Diesel, Diesel Max) and engine oil (Blaze Racing, HTP, Ultron, Rev X, Sprint 4T) entitles the customer to buy one Lamborghini Aventador toy car for only Php 250. Customers can only avail of the promo at the participating station where the Petron fuel or engine oil will be purchased. To do so, simply present the receipt of the participating products to the pump attendant. A toy car can be redeemed for PHP 250 for every PHP 500 spent on the Petron product. After the purchase, the receipt will be marked as “redeemed.” Any excess amount in the receipt will be voided and not valid for a next redemption. Cash and credit transactions, as well as bulk, P.O. and wholesale transactions are qualified to participate in this promo. Only receipts from the promo period can be used to redeem the Petron Lamborghini Aventador Toy Car Collection. For the list of participating Petron stations, visit www.petron.com.